Aryana's mother put together a team of volunteers to help us bake! It was a spook-tacular project full of measuring, stirring, decorating, and devouring. What was your favorite part of baking? What is something that you enjoy baking or cooking? 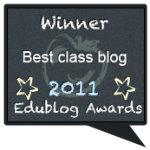 Having a classroom blog provides a plethora of opportunities to collaborate and create with classes all over the world. Recently, we were invited by Miss Jordan in Victoria, Australia, to participate in a monstrously creative writing project. 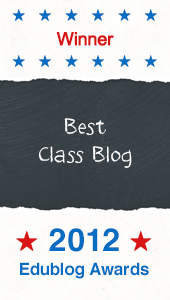 Miss Jordan's pupils are grade 4 students and have a classroom blog just like us! 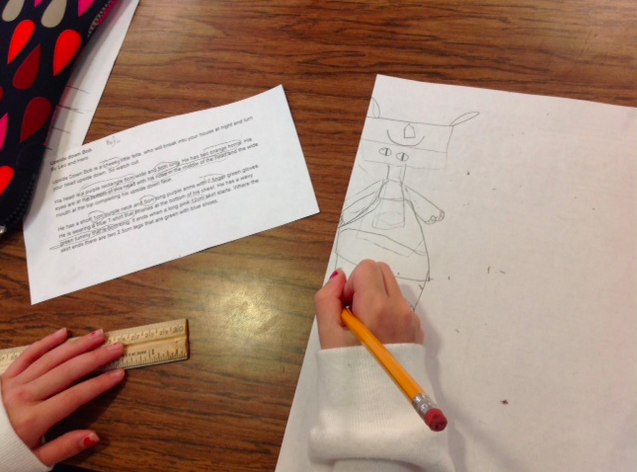 Step 1: Students draw a monster of their choosing. 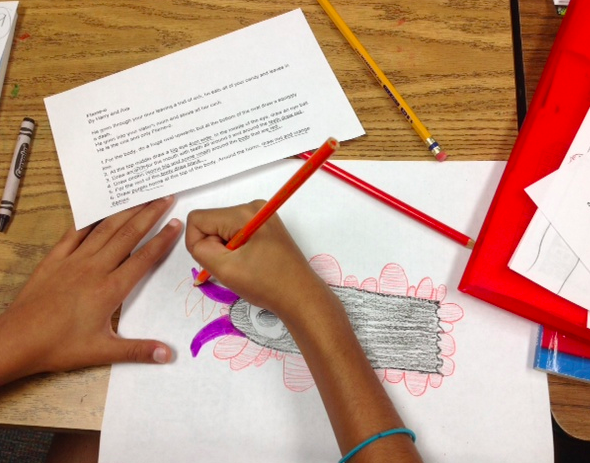 Step 2: Students write a paragraph detailing the monster. Important descriptive details to include are color, shape, and size. Step 3: Students trade the descriptive paragraphs with a blogging buddy. This was done via Google docs. 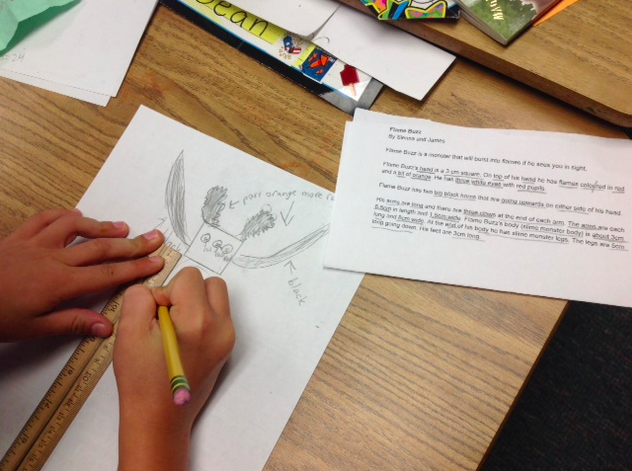 Step 4: Students draw their buddy's monster using only the descriptive paragraphs. 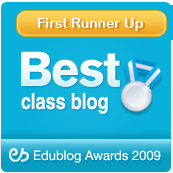 Step 6: Publish the results on the class blog and have fun reading and comparing! giving it a rough draft draw. 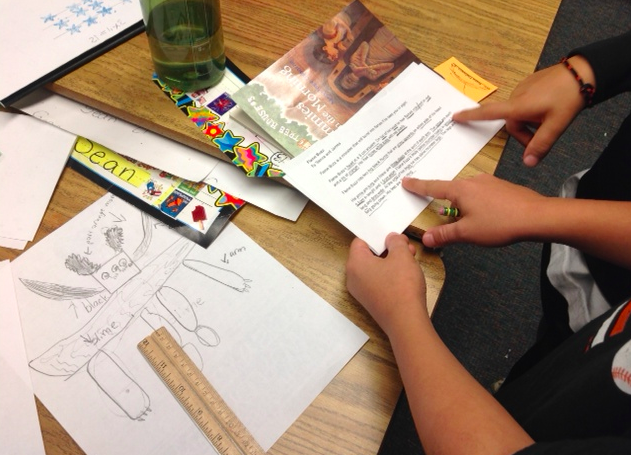 Sometimes students worked together to read and clarify a description. Rulers were employed as specific measures were given in the description. 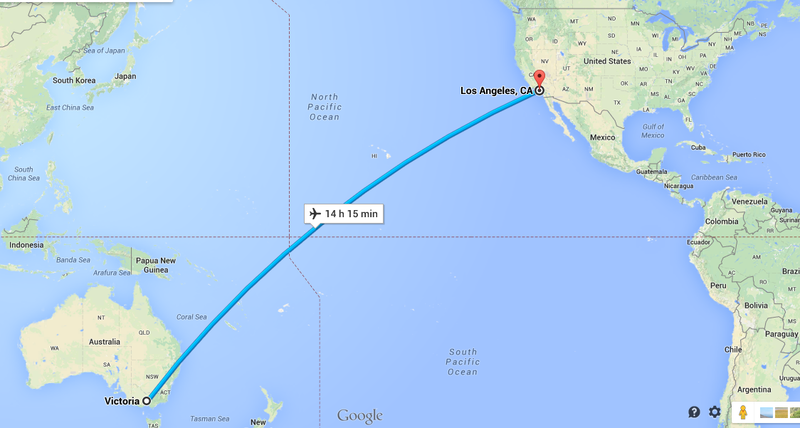 Since our buddies are from Australia, we used the metric system, centimeters and millimeters! Finally, the final drawings were colored. Next stop, the Photo Booth. 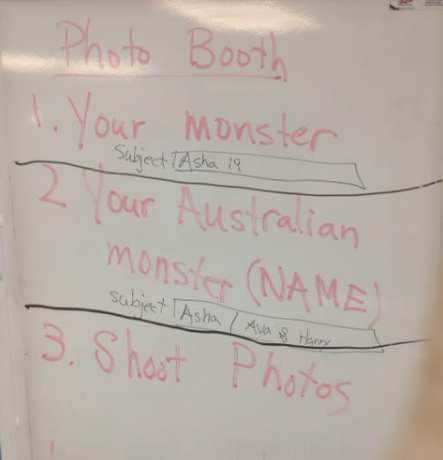 Student took photos of their monster and their buddy's monster. Each student emailed the photos to Mrs. Yollis. Student learned about the importance of the subject area of an email. The Photo Booth in action! 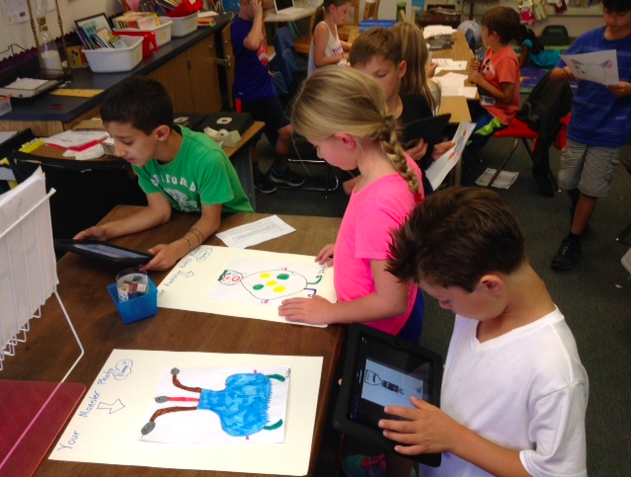 Once the photos and text were assembled in a Google Slide Show, we were ready publish! 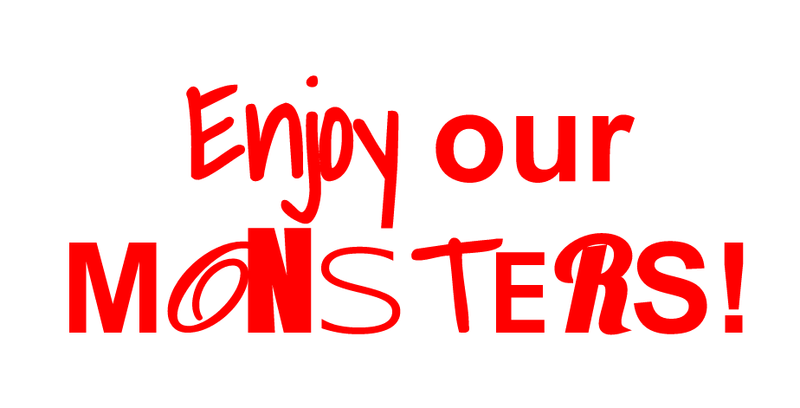 Click here to visit our blogging buddies' site with their monstrous slide show! What did you notice about your monster? How did your buddy do with your directions? Did you miss any details? How can you tell? Who Will Visit on Character Dress Up Day? This Friday is Character Dress Up Day at our school! In class, we have been talking about who will be in our room. Some people are characters from our reading textbook like Anthony Reynoso, Ms. Gernsblatt, or Mulan. Others are from chapter or picture books. I've heard that Cam Jansen, Katie Kazoo, and even Harry Potter will be in attendance this Friday! Leave a comment as if you are the character! What name tag will you be wearing? 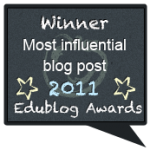 What props will you use in the classroom? This week we enjoyed an entertaining, yet purposeful assembly! 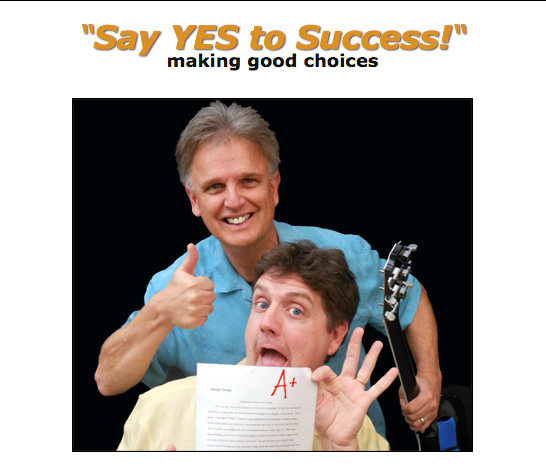 Mark and Obediah from Razzle Bam Boom are talented musicians with an outstanding message! They introduced their five strategies to being a “G.R.E.A.T.”TM student. Goals – Know what you want to do. Excel – Always do your very best. Attention – Focus on the most important things. 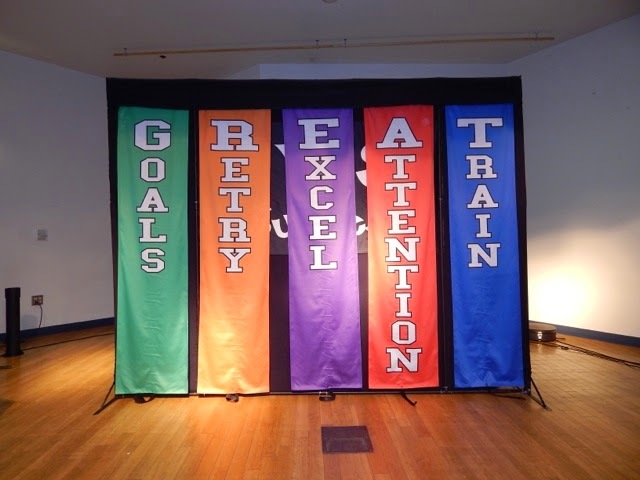 Train- Practice until you are GREAT. What will get your ATTENTION? Thank you, to the PFC for making this awesome assembly possible! Today, Mrs. Minicozzi came into our room and taught us all about Haiku Deck! In class, we have been talking about topics and details, so this visual app was a fun way to practice these concepts. First, Mrs. Minicozzi gave each student a month of the year and a planning sheet. On the planning sheet, the students wrote their topic and then came up with 4-6 details about that month. Some of the details were national holidays or typical seasonal events. Sometimes students added birthdays. Once the plan was approved, students logged into the class' Haiku Deck account and started creating their slide show. Each detail became a word or phrase and the students looked for a Creative Commons photo to complement the detail. 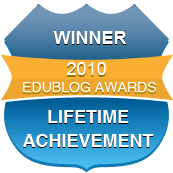 Mrs. Yollis published the Haiku Decks on this class blog. The HTML code used was modified to fit. The height was "304" and the width was "480". Hint: If you can't see the decks in Chrome, switch to Firefox. What are some tips for using Haiku Deck? Tell us how you changed your slides to make them better! How will you use Haiku Deck in the future? 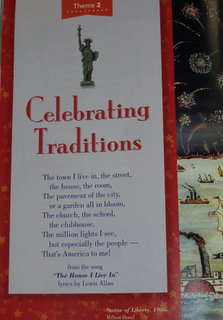 a new unit in Language Arts called Celebrating Traditions! 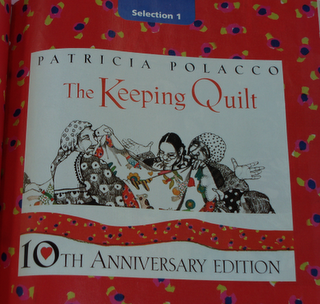 In the first story, "The Keeping Quilt," by Patricia Polacco, the author retells the story of her family's handmade quilt. In the story, a Russian immigrant mother and family arrive in the United States. She plans to make a quilt from a basket of old clothes, telling her daughter, "It will be like having the family in back home Russia dance around us at night." The quilt is passed along from mother to daughter for four generations. It becomes a Sabbath tablecloth and a wedding canopy. It even becomes a blanket for new generations of children. "The Keeping Quilt" is a heart-warming story about one family's tradition. Students: Your comment is due on Friday, October 10th!